As a Service Desk manager, you need to proactively manage your support queue efficiently , analyze incoming ticket trends and minimize loss due to any SLA impacts. Get started with Analytics Plus to get ahead of service impacts, before they spell trouble for your customers. Get out-of the box analytics for change, request and task modules. 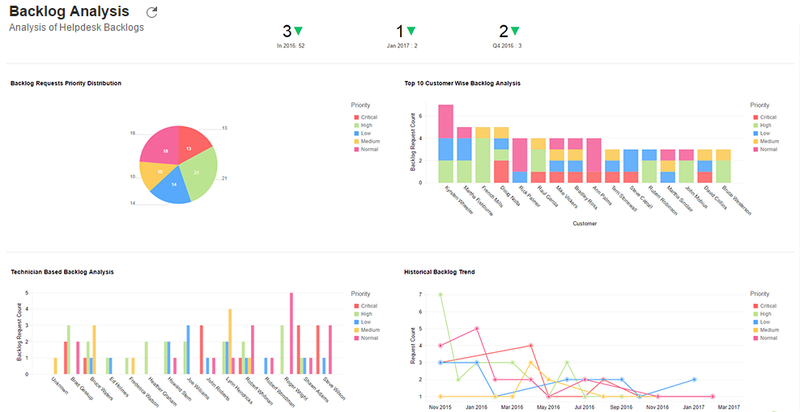 100+ prebuilt reports for 80+ KPIs, tailor made for ServiceDesk Plus users. Visually analyze your ITSM data using a wide range of charts, tabular and summary reports. Modify or Create interactive dashboards & reports, using a flexible drag-and-drop visual studio. Share and collaborate data and reports for better decision making. Embed reports and dashboards across websites, intranets, blogs and applications. Access your dashboards via Web or mobile devices.